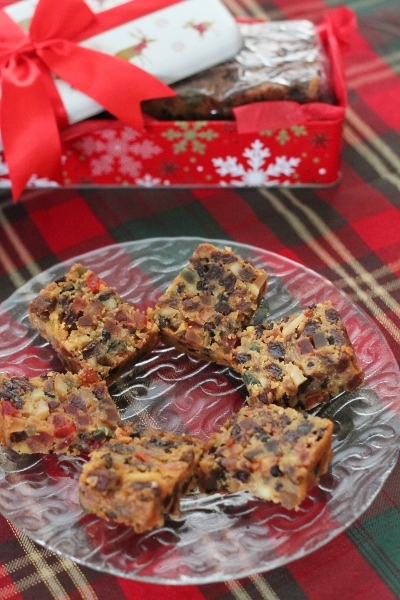 This recipe is taken from LCBO’s Food & Drink Summer 2011 issue. I had been looking out for it and was quite pleased to see it was available when I went to get some summer beers yesterday. 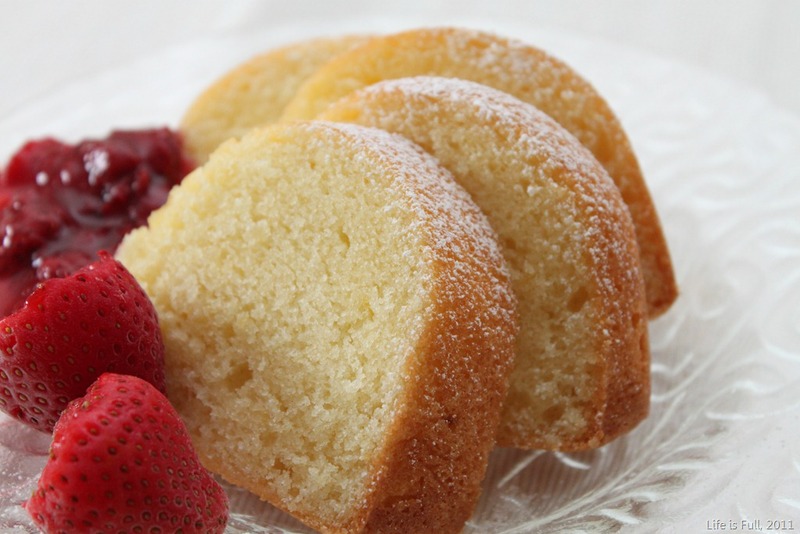 This pound cake doesn’t require the usual creaming of butter and sugar and uses a combination of oil and butter. 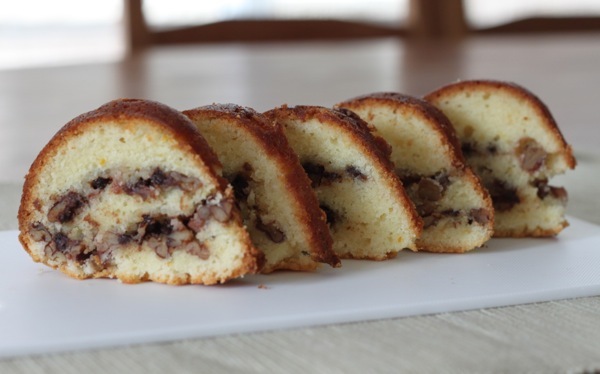 It produces a soft and buttery cake with slight tartness from the lemon. The original recipe served the cake with a sauce made from fresh strawberries and strawberry jam but I used my own homemade strawberry sauce instead. 1. Preheat oven to 325 degrees F (160C). 2. Separate eggs, placing whites in a clean mixing bowl. Place yolks in a small bowl. Using extra, very generously butter and flour a Bundt pan. 3. Place measured flour into a large mixing bowl. Stir in 3/4 cup sugar along with salt and baking soda; mix well. Finely zest lemon with a rasp; squeeze 2 tbsp juice. 4. Slowly add oil in batches to very soft butter, stirring well after each addition. Stir in yolks; then zest, juice and vanilla. 5. Beat egg whites until foamy; beat in cream of tartar. 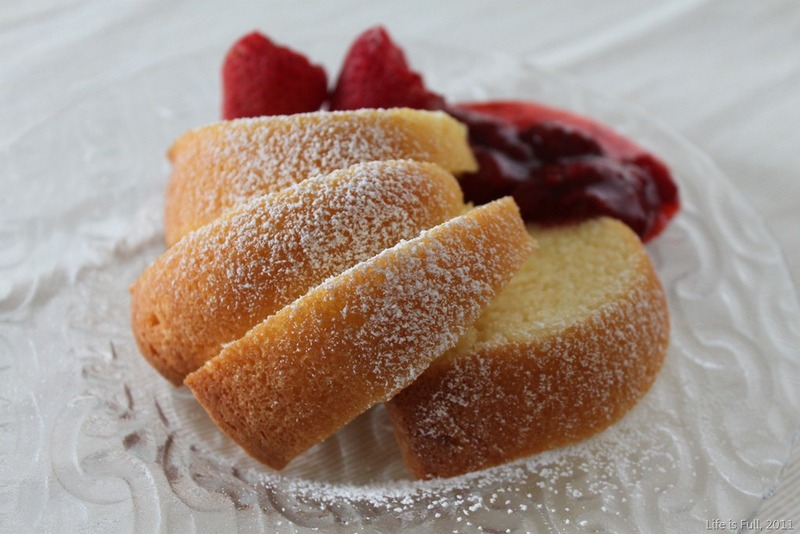 When soft peaks form, gradually beat in remaining 3/4 cup sugar until glossy stiff peaks form. A bit of whipped egg rubbed between fingers feels smooth, not gritty. 6. Make a well in the flour mixture; add butter mixture all at once. Stir until all flour is absorbed. Using a large rubber spatula, fold 1/3 of whipped whites into dough until evenly mixed. Then fold in remainder just until streaks almost disappear. Turn into prepared pan; smooth top. 7. Bake in centre of preheated oven for 45 minutes or until a cake tester inserted in cake middle comes out clean. Cool upright on a rack for 15 minutes to firm up cake. Then loosen and turn out upside down to finish cooling on rack. 8. 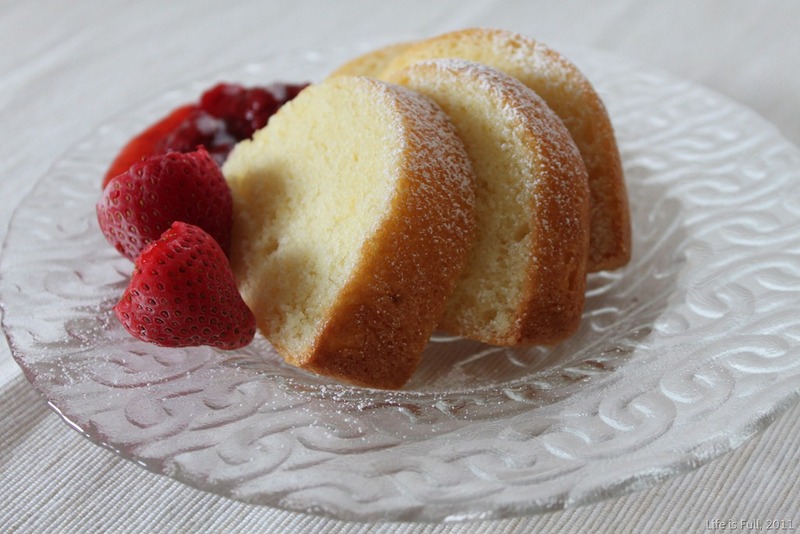 To serve, dust cake top lightly with icing sugar in a small sieve. Serve slices with some berry sauce. * I used sunflower oil but I may have mistakenly used half a cup! Put the strawberries, maple syrup, lemon juice and zest (if using) into a medium saucepan and cook over medium-low heat for 10 mins. Taste and add the the 1 tablespoon sugar if it’s not sweet enough. Mix the cornstarch with 2 teaspoons water and add to the saucepan. Continue to simmer for another 10 minutes or until thickened. Remove from heat and mash lightly with fork to break up the bigger pieces. If you want a smooth sauce, puree the cooled sauce in a blender. 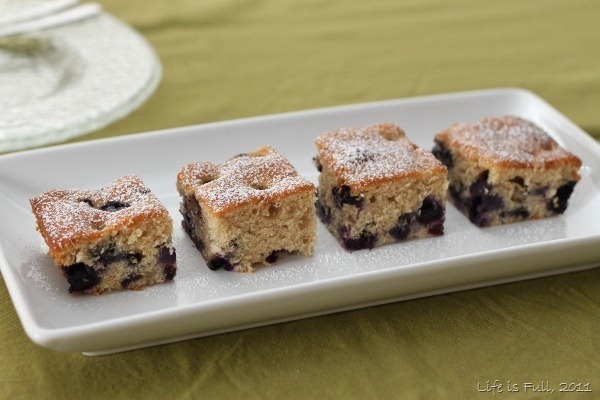 I made a simple cake for tea the other day, a Dorie Greenspan cake – Blueberry-Brown Sugar Plain Cake. 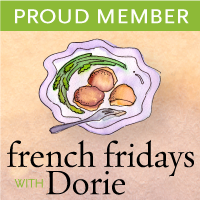 Blueberries were on sale that week – $1.99 a pint – and they were sweet not tart. Eating them with (or in!) cakes is my favourite way of eating many blueberries at one go! 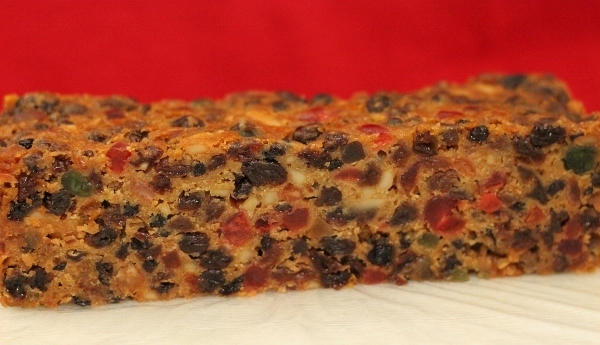 This cake is called a plain cake – “no crumbs, streusel, nuts, icing or filling” – but it is not plain in taste. 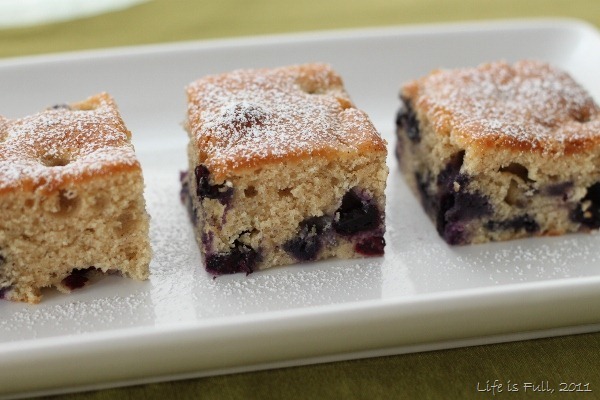 It is very moist, with blueberries in almost every bite, and has a strong caramel flavour from the brown sugar. There’s also a hint of cinnamon. Preheat oven to 375 degrees F. Generously butter an 11-x-8-inch baking pan and place it on a baking sheet. Whisk together the flour, baking powder, cinnamon and the 1/8 teaspoon salt. Beat the egg whites with the pinch of salt until they form firm, glossy peaks. Put the butter and sugar in the mixer bowl and beat on medium speed until creamy. Add the egg yolks and beat 2 minutes more. Reduce the mixer speed to low and add half the dry ingredients, then all of the milk and then the remainder of the dry ingredients, adding each new batch as soon as the previous batch has been incorporated. Using a large rubber spatula, stir in about one quarter of the stiffly beaten egg whites. Gently fold in the rest of the whites. Still working with a light hand, fold in the blueberries, and scrape the batter into the prepared pan. 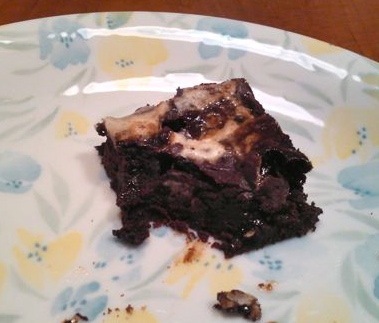 I made another recipe from the Williams-Sonoma cookbook. This time it’s Banana-Nut Bread made with 3 very ripe bananas – one from my fridge and two from my neighbour’s freezer. 🙂 It’s the first time I’ve used frozen bananas and I must say, when they’re defrosted and peeled, they look highly unappealing! Thankfully, the flavour remains the same. 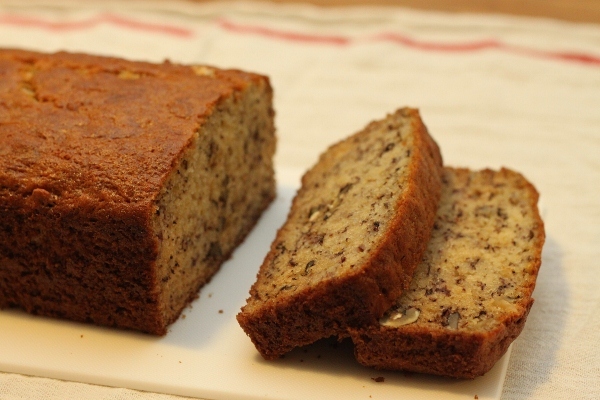 This banana bread is soft but not cake-like and it makes a very good snack. Preheat oven to 350F. Grease and lightly flour a 9-by-5 inch loaf pan. In a stand mixer fitted with the paddle attachment, beat together the butter and sugar on medium speed until creamy, about 1 minute. Add the mashed bananas and eggs and beat until smooth. Add the buttermilk and beat on low speed until just combined. In a bowl, stir together the flour, baking soda, baking powder, nutmeg, salt and nuts. Add the dry ingredients to the banana mixture and beat until just combined. The batter should be slightly lumpy. Scrape down the sides of the bowl. Pour the batter into the prepared pan. Bake until the loaf is dark golden brown and dry to the touch and the edges pull away from the pan sides, 55 – 60 minutes. A cake tester inserted into the centre should come out clean. Let rest in the pan for 5 minutes, then turn out onto a wire rack and let cool completely. It’s been so long since I’ve baked on a weekend. I had time yesterday and really wanted to bake but couldn’t decide on what to bake. So I opened the question to the family. 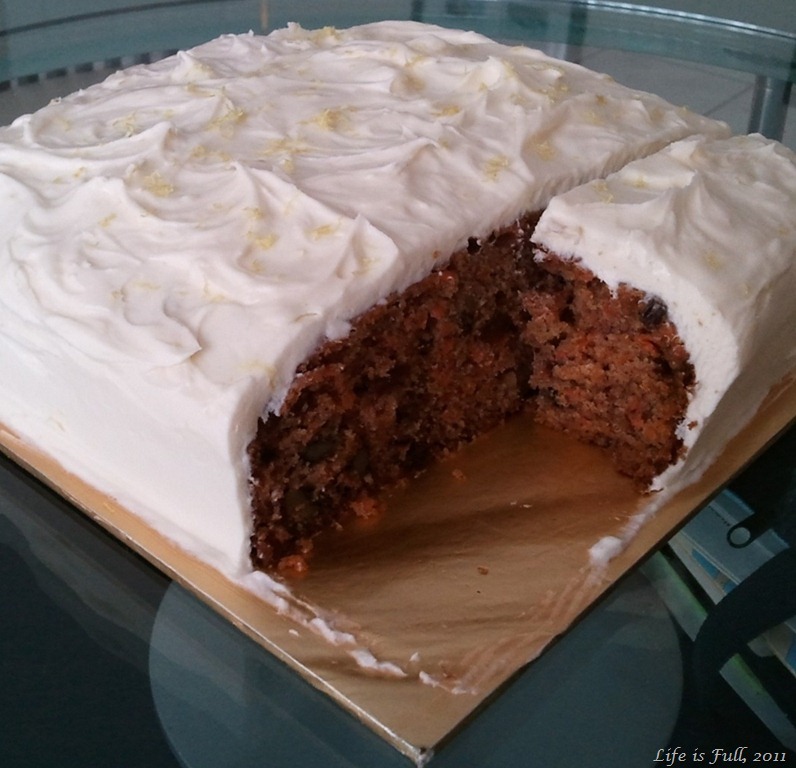 Hubby said, “Marble Cake” and Little Guy said, “Carrot Cake.” I chose Carrot Cake for I have a good one in my notebook of handwritten recipes that is quick and easy to make. 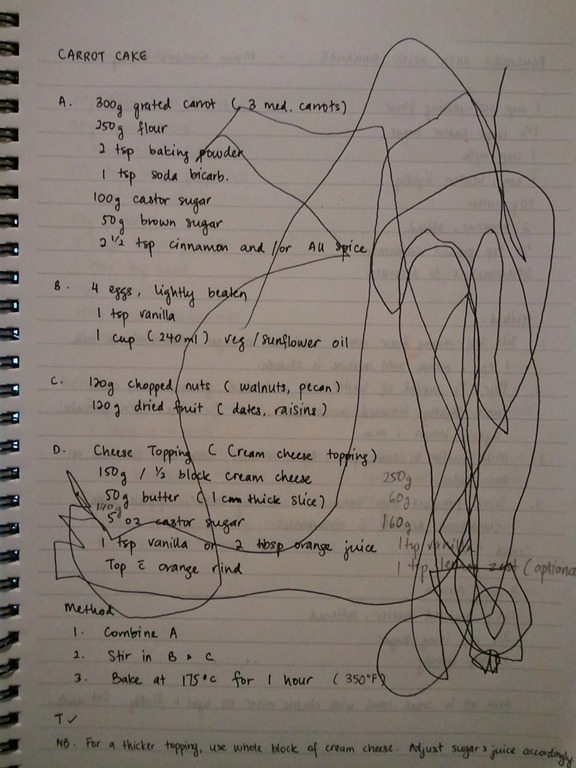 As an aside, if I were to make a digital copy of this recipe in the future I still won’t discard this page. Big Kid scribbled on it when he was 3 or 4 and it’s a sentimental reminder to me of the time when he was a cute little preschooler just discovering a pen. 1. Line a 8″ square cake pan with parchment paper and preheat oven to 350 degrees F / 175 degrees C.
2. Combine A in a medium bowl with a fork, making sure the carrots are not in clumps. 3. Combine B in a small bowl and, using a spatula, mix it into the dry ingredients (A). 5. Scrape batter into pan and bake for an hour. Let the cake cool completely before frosting. 6. 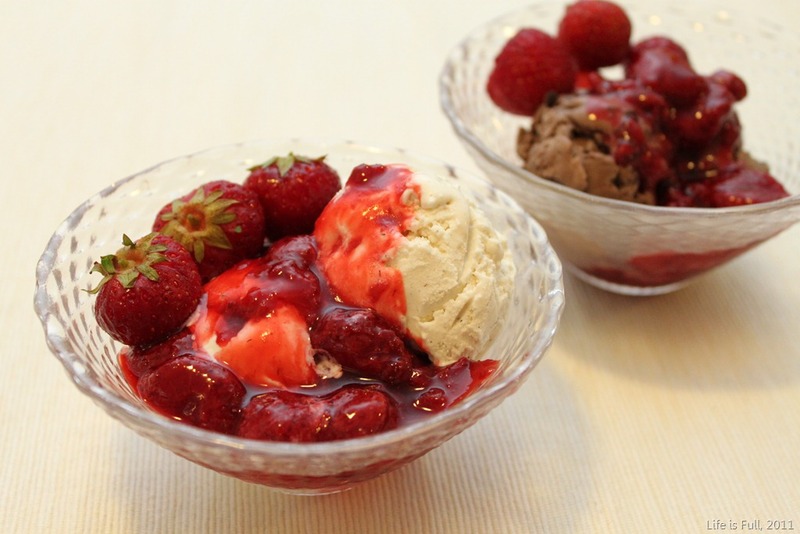 To make the frosting, cream the ingredients in a bowl with an electric mixer until the frosting is fluffy and smooth.